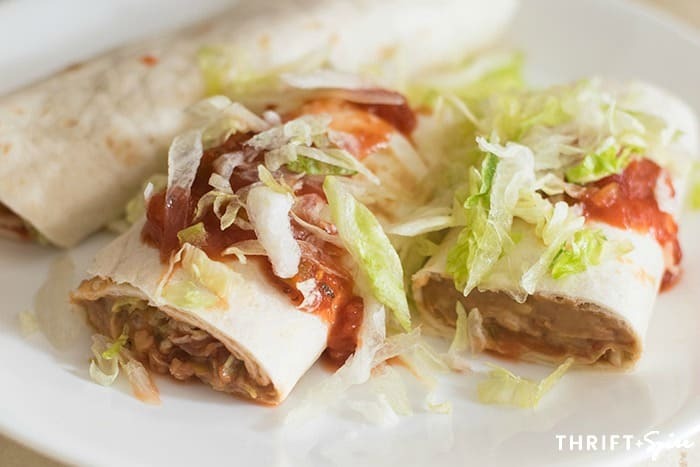 An easy bean burrito recipe is the perfect way to save you time and money. The ingredients for the bean burrito recipe are inexpensive and the recipe comes together in a cinch. Plus, your whole family is sure to love them! Hey everyone, it’s me Carissa I’m so glad to be back at the melrose family! Today I have a super easy bean burrito recipe to share with you all. It’s the perfect recipe for busy moms like Jenny and myself as it literally takes minutes to make! 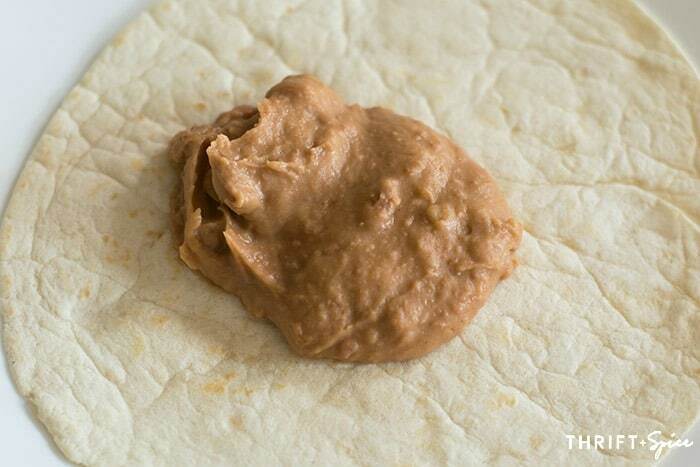 My mom used to make this easy bean burrito recipe all the time for my sister and I growing up. She was a single mom who often worked two jobs. So she didn’t have a ton of time to spend in the kitchen nor a lot of money to spend on groceries. Luckily for her this meal was inexpensive, quick and filling. This bean burrito recipe uses canned beans because that’s what she always used. But you can always make your own. It’s even cheaper if you make your own by the way! I hardly ever make recipes this simple but when I do it’s a real joy. It means less cleanup time and more time I can spend with my family. I know it can sometimes be hard for us busy moms to spend quality time with our families. If we’re not working then there’s a sink full of dishes or loads of laundry just waiting to be done. It can definitely be overwhelming at times. That’s why it’s important to have a repertoire of easy recipes you can whip up in no time. 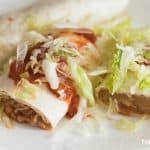 This bean burrito recipe is one of my favorites to have on hand. Another easy recipe you may like are chicken quesadillas. Lately I’ve been trying to simplify my life a little more. At least in the kitchen that is. For example a few weeks ago I bought a whole bunch of chicken drumsticks and cooked and shredded it. For dinner that week we made chicken tinga, enchiladas, and quesadillas. The chicken was already cooked and ready to go so it saved me a whole lot of time! Heat up a 31 oz can of refried pinto beans in a pot. Add 1 cup of shredded cheddar jack cheese to the beans and cook until melted. Heat up 8 flour tortillas in a skillet over medium heat. Heat them up on both sides for about 20 seconds. 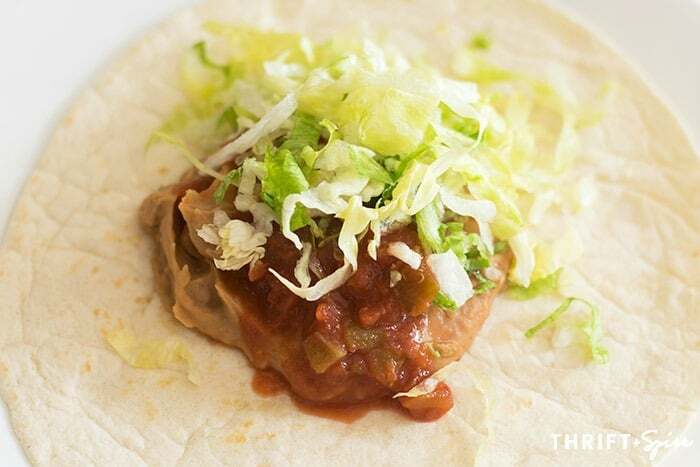 One tortilla at a time add a small amount of beans to the tortilla.Top it with salsa and lettuce. Now roll it up and add more salsa and lettuce if desired. Use flour tortillas for burritos. Don’t fill the tortillas too much or they’ll be difficult to roll up. Cut them in half to make them easier to eat. Get creative: add rice, corn, beef or even scrambled eggs to make them breakfast burritos. 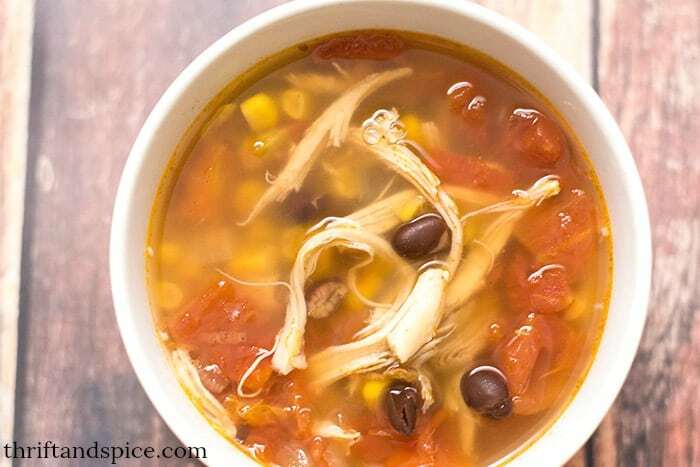 Black beans can substituted for the pinto beans. See how easy that was? This is a very filling meal so no sides are needed.However if you wanted you could serve rice on the side. Feel free to get creative and make these bean burritos your own. The possibilities are endless! You can make your own salsa to serve with these or just use your favorite bottled one. If you still have flour tortillas left over you can make these easy sopapillas as a dessert. They also take only minutes to make and kids love them! 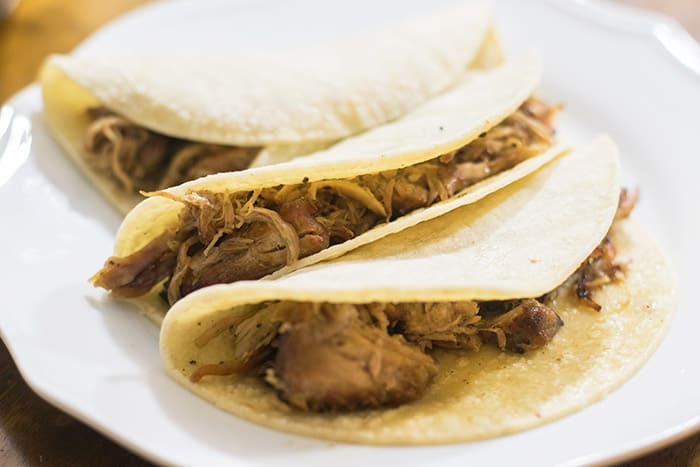 If you are a Mexican food lover like myself then I have an awesome FREE 1 week Mexican dinner meal plan you can get when you subscribe to my newsletter. I think you’ll really like it! I really hope you enjoyed today’s recipe. Thank you so much for having me back! This bean burrito recipe takes just minutes to make and will fill up your whole family. 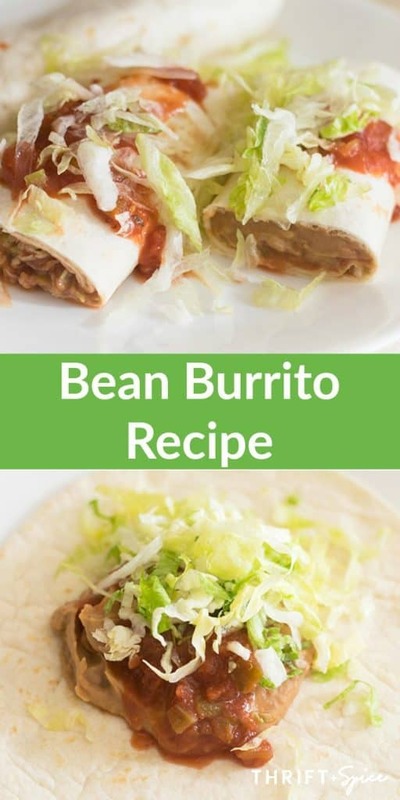 This Bean Burrito Recipe is a quick and easy recipe that is sure to fill up the whole family. Heat up the refried beans in a pot over medium heat. Add the cheese to the beans and stir. Cook until the cheese has melted. Heat up the tortillas in a skillet over medium heat. Heat up on both sides for about 10-20 seconds. Add a small amount of the beans to one tortilla. Top with salsa and lettuce. Serve. Garnish with more salsa and lettuce if desired. 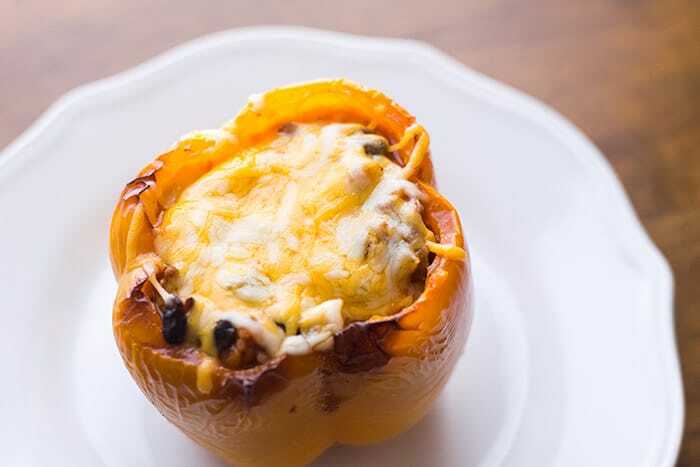 If you liked this Bean Burrito Recipe you might also like….